Can anyone help to give any clues about identifying this part? It is from a Chinese guitar pedal and appears to be at the beginning of the input chain, so I would suspect perhaps some kind of op amp, but might be wrong. None of the markings seem to match any prefixes in the SMT codebook, etc. but I just wondered if it might happen to mean anything to someone with more experience. It is a DIO2022 op-amp, see datasheet. It looks like other manufacturers make op-amps with type code of 2022 as well. Putting part markings into a search engine can quite often solve this type of question pretty quickly. 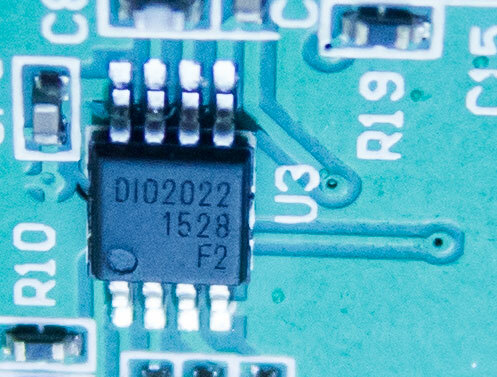 This is a DIO2022 from Dioo Microcircuits. Seems like a pretty generic op amp. I've never heard of the manufacturer before, but they seem to be based in and primarily do business in China, which would make sense as you say this is from a Chinese device. Not the answer you're looking for? Browse other questions tagged identification surface-mount or ask your own question. Help identify SMD part - and why is the last letter rotated? Help me identify an SMD diode?